Three UCT students have won the national competition of the Pernod Ricard’s International Business Game, a competition to create a digital marketing strategy. Business Science students Tetlanyo Lekalake and Thembeka Setlogile and computer science major Sizwe Ndlovu of the Faculty of Science came out tops. They will be representing Pernod Ricard South Africa at the international finals in Paris in March this year, when they will compete against the world’s top marketing students for the lead prize – an internship in Europe at one of Pernod Ricard’s holding companies. The students, called the Brandiacs, created an innovative digital application aimed at helping the Absolut Vodka brand remain “the creative visionary among its competitors”. The next series of this competition will be rolled out nationally at the end of this year.Final-year and postgraduate students can keep an eye out for more information on the Spirit of Entrepreneurs website. 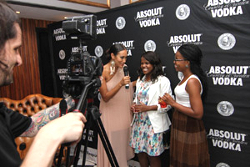 Brandiacs: The winners of Pernod Ricard’s International Business Game, UCT commerce students Tetlanyo Lekalake and Thembeka Setlogile, were announced at a gala event hosted by Jo-Ann Strauss (left).